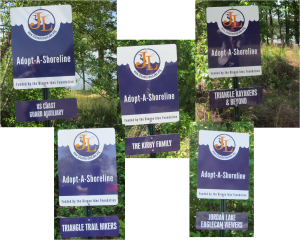 We have added five new groups to our Adopt-A-Shoreline Program since March 2013 bringing the total to 11. The goal is to keep recreational access areas clear of trash by conducting three cleanups per year while also using the signage to raise public awareness. 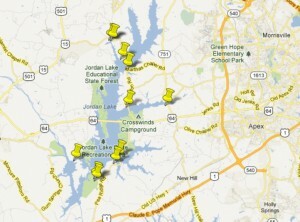 Here is the list of participating groups: Carolina Kayak Club; Great Outdoor Provision Company; Jordan Lake EagleCam Viewers; Jordan Lake Environment Education; North Carolina Geocachers Org. ; Raleigh Sail & Power Squadron; The Kirby Family; Triangle Kayakers & Beyond; Triangle Trail Hikers; US Coast Guard Auxiliary; and the Weaver Creek HOA. The general locations of the adopted sections appear on the map below. This Google Map provides exact descriptions of each along with locations of other sections available to adopt. Details of the Adopt-A-Shoreline Program are found at our website.